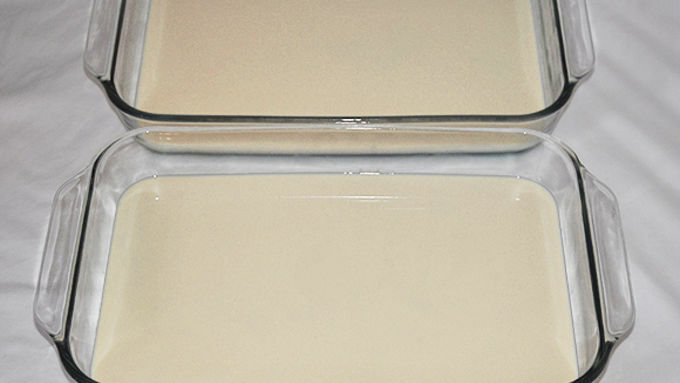 Prepare two 9x13 glass baking pans by spraying lightly with cooking spray. With a paper towel, wipe spray until only a very light layer remains. This will help the gelatin release later. 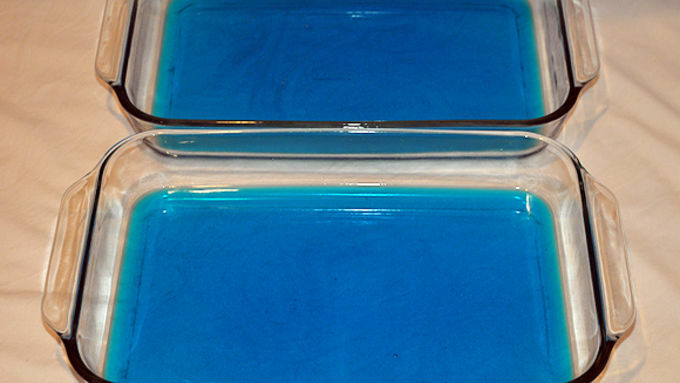 BLUE GELATIN: Mix 3 packages of blue gelatin with 1 packet of unflavored gelatin. Add 1-3/4 cup boiling water and stir until gelatin is completely dissolved. Add 1-1/4 cup vodka and stir well. Divide gelatin mixture evenly between the two pans. Set in refrigerator 20 minutes, until gelatin is set to the touch. WHITE GELATIN: Add 2 packets of unflavored gelatin to 1-1/4 cup vodka. Let sit 2 minutes. Add 1/2 cup boiling water and stir to completely dissolve gelatin. In another bowl, mix 1/2 cup boiling water with the can of sweetened condensed milk. Add milk mixture to gelatin mixture and stir to combine well. Remove pans from fridge. Divide white mixture evenly and pour it over blue layers in both pans. (TIP: Pour mixture slowly over an inverted measuring cup so it doesn't disturb the existing layer.) Return pans to fridge for 30 minutes. RED GELATIN: Mix 3 packages of red gelatin with 1 packet of unflavored gelatin. Add 1-3/4 cup boiling water and stir until gelatin is completely dissolved. Add 1-1/4 cups vodka and stir well. Remove pans from fridge. 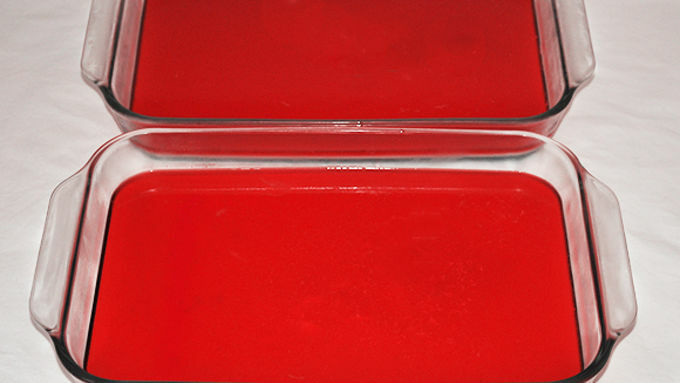 Divide red gelatin evenly and pour it over the white layer in both pans. (TIP: Pour mixture slowly over an inverted measuring cup so it doesn't disturb the existing layer.) Return pans to the fridge for 3 hours or overnight to fully set. Remove pans from fridge. Using your cookie cutters as a size guide, cut pans into squares that will fit the cutters. Place a square on a plate or cutting board. Press the cookie cutter with even pressure, then -- while holding the cutter in place with one hand -- use your other hand to remove the excess gelatin from the edges. 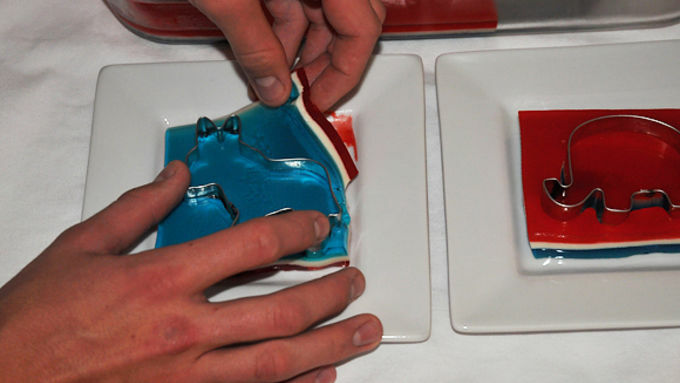 Carefully remove the cookie cutter and place shaped gelatin on a serving platter. NOTE: Invert the squares for the donkey shapes so the blue color is on top! Flavored vodkas would be great in this recipe. Try cake, cotton candy, marshmallow or vanilla vodka -- or your fave flave! Substitute water for the vodka in all instances. Available in specialty kitchen stores or online. Who’s gonna even care how the vote turns out on election night when you’re serving these bipartisan Election Jelly Shots?! Election night: It's a grin if ya win, or a snooze if you lose. 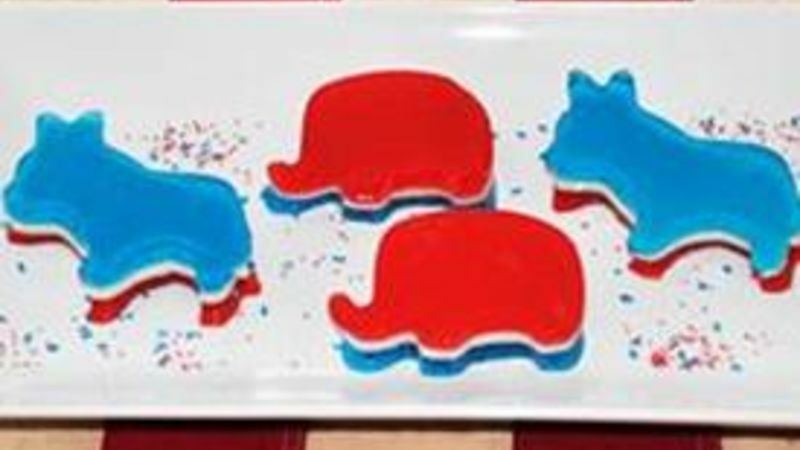 But no matter how the votes swing, you’ll be stretching across the aisle offering your friends these patriotically perfect donkey and elephant jelly shots dressed head-to-toe in USA. Consider it your reward for getting your vote on. Are you a campaign volunteer? Whether you're manic for Mitt or batty for Barrack, these Election Jelly Shots in your party’s shape will be a straight-up hit at headquarters for sure! And -- best of all -- these are easier than filling out a ballot. Plate 'em up for the partay! Add flair with flames if you want, and get jelly shottin'! Kiddie Version Oh, yes. You can make these for the fam or your kid’s after-school student senate meeting. Just substitute water for the vodka and your politician wannabes will grin bigger than Joe Biden. Don’t Toss the Leftovers! When you cut the gelatin into shapes, you’ll have some leftovers from around the edges. Just chop those up and put them in small shot glasses for more red-white-and-blue down-the-hatches! So, America, get out the vote -- then get out the jelly shots!